We have been in business as an open shop since 1990, first in Independence, MO., then in Tubac, AZ, and are now back in Independence, MO! We now are online only. 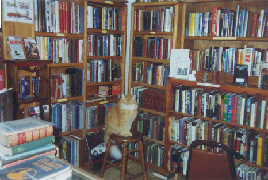 We specialize in Out of Print; Hard to Find; First Editions; Rare & Antique; or otherwise special Hardback Books in many subject areas. All are carefully selected both for their content and condition. All dust jackets are covered with clear Brodart covers. We try to avoid book club editions, ex-library books or "hurt" books. Please feel free to browse or search our catalog for that book you've always wanted. For your special subject area, please check under keywords. Please note that "Categories" are arbitrarily created by ABE and may or may not be accurate. Keywords, however, will be.